McLaren has designed a totally new innovative tread pattern. The tread pattern has been developed based on McLaren’s 20 years of field experience and millions of working hours. Until now there has always been a tradeoff between traction, smooth ride, and durability. Terrapin is the first track that offers great traction, a smooth ride, and excellent durability in severe rocky conditions. Researched and tested, the Terrapin is the future of track design technology. 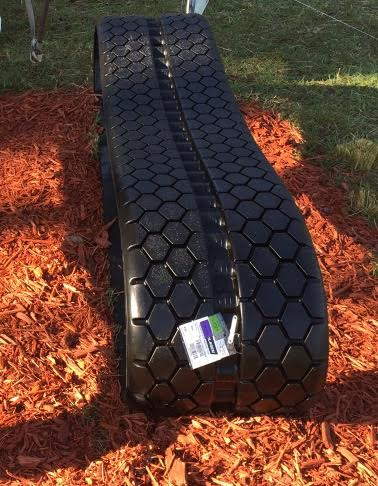 The Terrapin’s unique tread design makes it the most versatile rubber track on the market. Now you can have excellent traction in snow and sand and still be able to cross grassy areas with minimal disturbance. The Terrapin tread design also outperforms all other tread designs on the market and outperforms in rocky conditions. The best all-around performer with the longest life in rocky conditions!